Long time no speak! It feels like I haven't posted in ages, but I have been settling into my new job. I have to admit I love it :D I'm so happy and even though its pretty busy at times its what I call "good busy" because I'm doing something I love. I have also been made to feel really welcome by my new work friends and I have been busy personalising my desk with all my beauty bits and bobs. I think they definitely know who's the beauty blogger in the office haha! I think my blogging routine might be a little all over the place for a while, just until I find my natural flow... as this is my first full time job. However, I'm sure you lovelies will understand and support me through this little transition. I have been busy ordering work dresses and beauty bits, so I thought I would show you some bits the post man delivered to me yesterday. Today's post is going to be more of an initial thoughts post, as I have only gotten around to trying them out this morning. I hope you enjoy this post lovelies and as always if you ever need any help or advice then make sure you contact me via my Social Media icons. I also love hearing from you in my comments section! and I'm sure I'm not alone in saying that every comment truly makes my day. I feel like I'm the only person who hasn't tried a MAC foundation haha! but I have always loved my light and fluid foundations like the Chanel Vitalumiere Aqua and YSL's Le Teint Touche Eclat foundation. I have always thought of MAC foundation's as being higher coverage, but with being such a busy bee these days I feel like I need a longer lasting coverage to last the day without having to touch up. I used Findation to pick my shade (naughty) because you should always go in and get matched, but I seem to have got the knack for just knowing my shade haha. I decided to go with NC25 as it's more Yellow toned which I prefer in my foundations. I am lighter skinned, but I do get some "Redness" on my face so I find a Yellow tone helps to correct any discolouration. The first thing I noticed was its gel like texture and with a pea sized amount I felt the coverage was light/medium and not a million miles away from the kind of coverage I like. I then applied a little more and that's when I seen the coverage build up quite quickly. It did take while a while to sink into my skin and I found myself blending with two brushes to try and get it to look as natural as possible. However, I am quite impressed with the foundation and think it will be good for when I'm after a higher coverage option. These lipbalms/glosses are definitely well loved amongst the blogosphere, and I can honestly say nothing tops these in terms of their ability to really work, moisturise, add a hint of colour and also on top of all that they smell absolutely out of this world! I have used "Rose Shimmer" before, but decided to try "Apricot Shimmer" which is a lovely light shade that will be fantastic for keeping my lips looking and feeling good throughout my long days at work! I must admit this was a cheeky treat to myself after going through some quite stressful times recently. 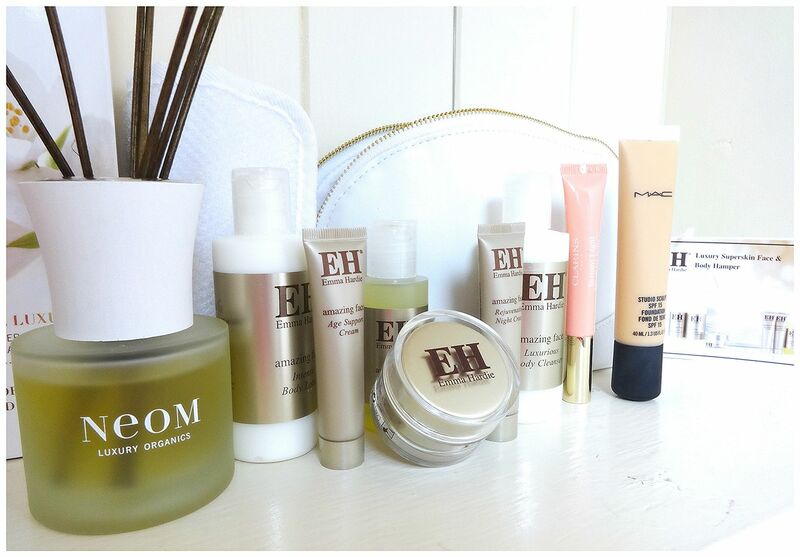 I'm a huge fan of the Emma Hardie Cleansing Balm, so I thought this little beauty hamper would be a fabulous way to try out some other products from the Emma Hardie range! I'm also planning some vacations.. so the lovely White and Gold beauty bag will come in very handy too haha! My love for NEOM continues haha! 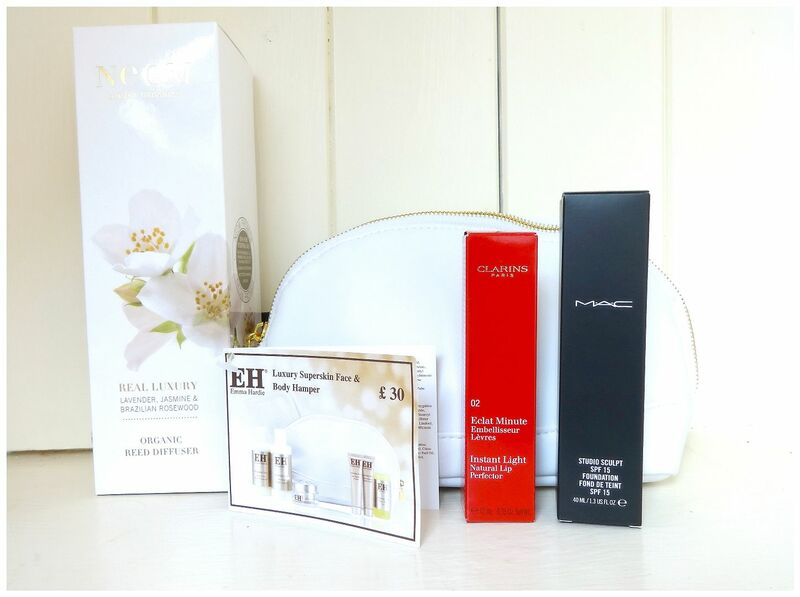 I have also put in an order for their "Perfect Nights Sleep Package" which contains some fabulous NEOM goodies to help you sleep peacefully, so I will get that on the blog as soon as I can. However, this gorgeous Organic Reed Diffuser will be fantastic for giving my room a Sophisticated, calming but light fragrance. I have really gotten into fragrances this year and I can't wait to try some other products from the range. I hope you have enjoyed this post lovelies! I will be writing full reviews for all the products mentioned in today's post, so don't forget to check back. I have the weekend off before I start back at work, so I am planning on writing some posts to put on the blog this week. I just wanted to take the oppotunity to say a huge thank you for always supporting me and my blog!